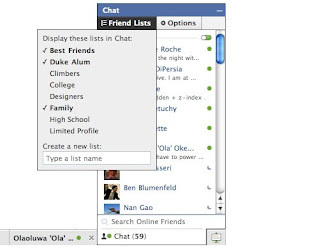 Facebook pushed some updates to its chat system. People can now go stealth mode and hide their online status from some friends, while staying online for the others. You can now categorize your friends into different lists, like family, colleagues etc and set the availability setting for each list. Once you create a list, you can either drag and drop contacts into it or if they are offline at that time, you can manually click the edit link and add users one by one. When you appear offline for a particular list, the contacts in that list can’t see your online status and neither can you see if they are online or not. The stealth mode can’t be applied to particular users but you’ll have to create a list of contacts for appearing offline to them.